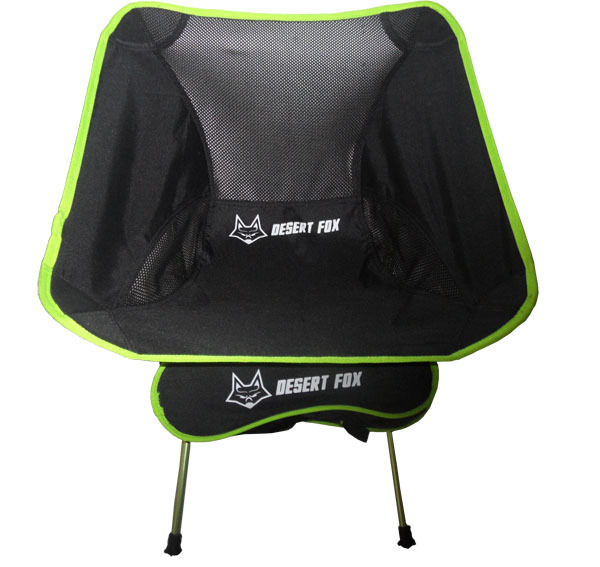 The Desert Fox EzSeat is a compact, feather-light camping chair offering lounge chair comfort wherever your adventure takes you. 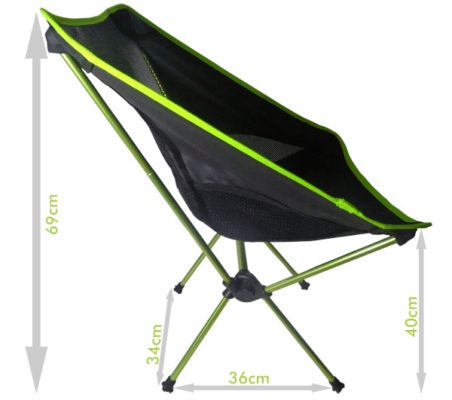 With excellent levels of strength, comfort and compactness, its design embodies some of the best qualities one would expect in a camping chair. Assembles and breaks down in under a minute. The frame is constructed with specially strengthened aircraft grade anodized aluminium rods that are all connected with an internal shock cord system. As soon as you remove it from its bag, the frame begins to snap itself together. Once the frame is snapped together, simply connect the seat cover. When breaking down, the internal shock cord system allows the frame to stay in one piece, with no loose poles to worry about. Done. In less than a minute! 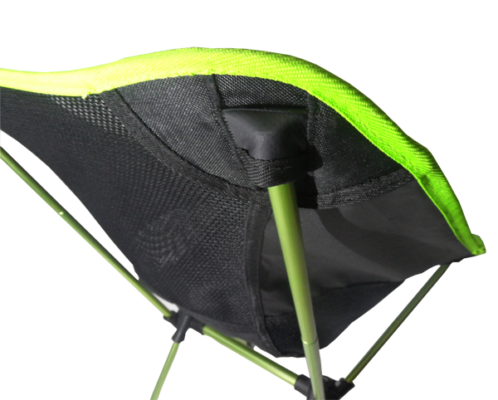 Most light-weight camping chairs either have little or no back support and often are very close to the ground. The EzSeat has been designed to provide a comfortable back support allowing you to recline in your chair, with ease. Additionally the back support is purposely angled relatively upright, allowing the neck to remain in a comfortable position, reducing the need to crane forward. The benefits of this seating position ensure you can easily eat or read without needing to readjust your position. Seat height is 40 cm above the ground allowing you to also stretch your legs while the mesh backing provides effective ventilation. The mesh backing also allows the seat cover to dry quickly should it get wet. 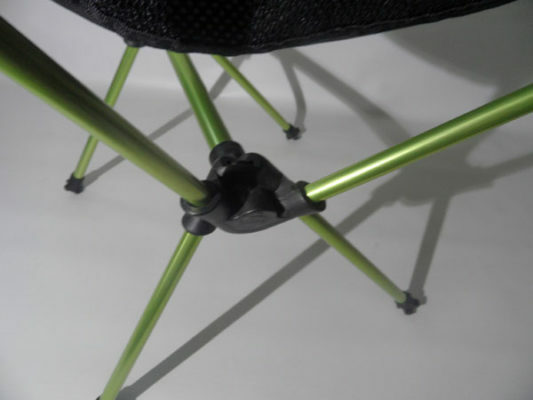 The frame is made from a specially strengthened aircraft grade anodized aluminium which ensures it is not only light and strong but, as important, totally rust resistant. Use it on the beach or when fishing near salt water with absolute confidence. The seat cover is constructed from durable 600D fabric (the same used in motorcycle jackets) with reinforcing panels and double stitching at stress points. The included carrying bag has various loops and daisy chains allowing you to carry or secure it to just about anything including the chair itself, on bike panniers, top boxes, back packs etc. Maximum Weight Capacity: 145 kg. At last a compact chair ideal for adventure motorcyclists, walkers, cyclists, campers, concert goers and just about any outdoor activity. 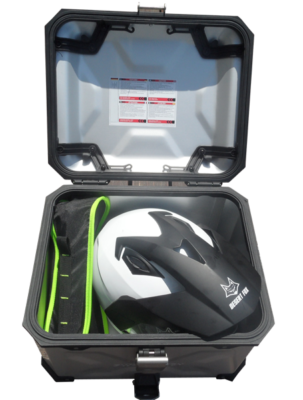 Fits in most top boxes with a peaked helmet (shown here with the Desert Fox Enduro Helmet and Trax 38L Adventure top box).